This 12" wide, high capacity vertical cable manager for 2 and 4-Post open frame racks features a single-sided cable channel with multiple internal cable tie-off locations and smooth plastic fingers at 1U increments for organized patching applications. 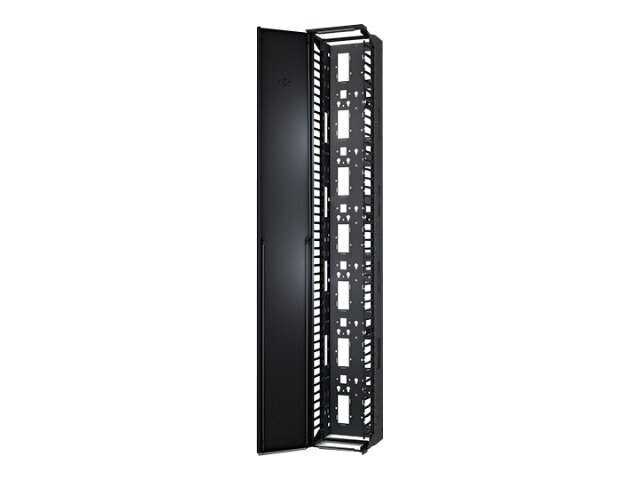 Cable management tie-off backplate - Backplates feature multiple mounting holes for toolless accessory installation of vertical Rack PDUs and optional cable management accessories such as hook-and-loop cable managers for cable tie-off (AR8621) and fiber spools for excess fiber slack management (AR8444). Grounding connection - Grounding connection point (hardware not provided) on left and right side of cable channel provides location for grounding the vertical cable manager. Horizontal cable routing front-to-back - Pass-through holes and mounting slots support horizontal cable troughs for front-to-back cable pass-through using optional cable management accessory AR8016ABLK. Similar look-and-feel to NetShelter enclosures - Contoured and powdercoat design of the vertical cable manager door and matching enclosure placard provide a clean and consistent look with NetShelter enclosures. Slam-to-latch full length door - Door installs quickly without tools and is provided with two easy to use latches that allow the door to open to the left or right. Toollessly mount vertical Rack PDUs - Backplates feature several mounting location positions allowing Rack PDUs to be toollessly installed with the vertical cable manager channel or on the backside. Vertical cable managers ship fully assembled - Vertical cable managers ship fully assembled reducing the amount of time required to install equipment.